Spawner.start should start the single-user server for a single user. Information about the user can be retrieved from self.user, an object encapsulating the user’s name, authentication, and server info. The return value of Spawner.start should be the (ip, port) of the running server. NOTE: When writing coroutines, never yield in between a database change and a commit. When Spawner.start returns, the single-user server process should actually be running, not just requested. JupyterHub can handle Spawner.start being very slow (such as PBS-style batch queues, or instantiating whole AWS instances) via relaxing the Spawner.start_timeout config value. Spawner.poll should check if the spawner is still running. It should return None if it is still running, and an integer exit status, otherwise. For the local process case, Spawner.poll uses os.kill(PID, 0) to check if the local process is still running. Spawner.stop should stop the process. It must be a tornado coroutine, which should return when the process has finished exiting. JupyterHub should be able to stop and restart without tearing down single-user notebook servers. To do this task, a Spawner may need to persist some information that can be restored later. A JSON-able dictionary of state can be used to store persisted information. Unlike start, stop, and poll methods, the state methods must not be coroutines. """load state from the database"""
"""clear any state (called after shutdown)"""
Some deployments may want to offer options to users to influence how their servers are started. This may include cluster-based deployments, where users specify what resources should be available, or docker-based deployments where users can select from a list of base images. 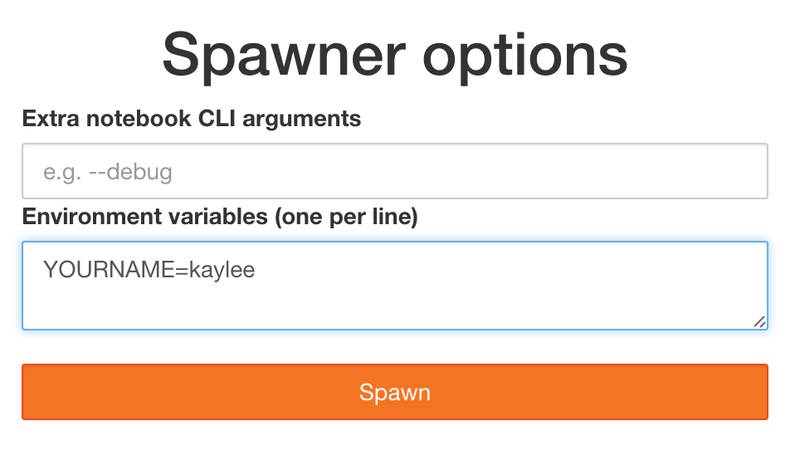 If Spawner.options_form is undefined, the user’s server is spawned directly, and no spawn page is rendered. See this example for a form that allows custom CLI args for the local spawner. When Spawner.start is called, this dictionary is accessible as self.user_options. If you are interested in building a custom spawner, you can read this tutorial. Some spawners of the single-user notebook servers allow setting limits or guarantees on resources, such as CPU and memory. To provide a consistent experience for sysadmins and users, we provide a standard way to set and discover these resource limits and guarantees, such as for memory and CPU. For the limits and guarantees to be useful, the spawner must implement support for them. For example, LocalProcessSpawner, the default spawner, does not support limits and guarantees. One of the spawners that supports limits and guarantees is the systemdspawner. c.Spawner.mem_limit: A limit specifies the maximum amount of memory that may be allocated, though there is no promise that the maximum amount will be available. In supported spawners, you can set c.Spawner.mem_limit to limit the total amount of memory that a single-user notebook server can allocate. Attempting to use more memory than this limit will cause errors. The single-user notebook server can discover its own memory limit by looking at the environment variable MEM_LIMIT, which is specified in absolute bytes. c.Spawner.mem_guarantee: Sometimes, a guarantee of a minimum amount of memory is desirable. In this case, you can set c.Spawner.mem_guarantee to to provide a guarantee that at minimum this much memory will always be available for the single-user notebook server to use. The environment variable MEM_GUARANTEE will also be set in the single-user notebook server. The spawner’s underlying system or cluster is responsible for enforcing these limits and providing these guarantees. If these values are set to None, no limits or guarantees are provided, and no environment values are set. c.Spawner.cpu_limit: In supported spawners, you can set c.Spawner.cpu_limit to limit the total number of cpu-cores that a single-user notebook server can use. These can be fractional - 0.5 means 50% of one CPU core, 4.0 is 4 cpu-cores, etc. This value is also set in the single-user notebook server’s environment variable CPU_LIMIT. The limit does not claim that you will be able to use all the CPU up to your limit as other higher priority applications might be taking up CPU. c.Spawner.cpu_guarantee: You can set c.Spawner.cpu_guarantee to provide a guarantee for CPU usage. The environment variable CPU_GUARANTEE will be set in the single-user notebook server when a guarantee is being provided.